Several years ago, scuba diving was the preserve of 'frogmen'; The James Bond films created the myth that diving was only for the very fit, mainly males in the 30-45 years old age bracket. Today there is a general recognition that diving has a much wider range of ages and abilities. The myth that children's lungs are insufficiently developed has been debunked; smaller sizes of equipment are available; sensible limits have been developed, and now children can and do learn to dive. 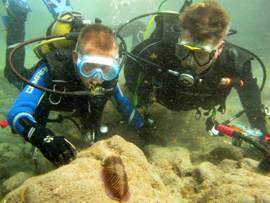 Davy Jones Diving have been offering courses to young people from the age of 10 upwards for the last ten years, and we understand the key questions and issues relating to younger divers. With three senior instructors who are PADI Master Trainers and also hold Elite PADI status you can be sure that safety is our number one aim. 5 stars - "Junior Scuba Diver"
Me and my dad were due to go to Egypt but couldn't because the trouble that was happening there so looked and found Davy Jones dive centre on the Internet. 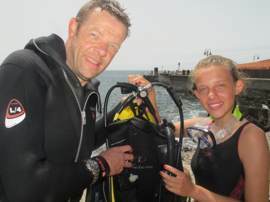 I am 11 and we chose the PADI open water course so I could dive with my dad in future. ... On the last few days we began going into open water where for the first time I went to 12 meters. I didn't pass for an open water but for a junior scuba diver so I have to dive with an instructor. Jessica was my instructor and was great and really helped me. It was a bit cold as was Easter time but saw loads. Thank you. 5 stars - "Perfect for the family"
We were diving with 2 teens who had passed their course a year ago so had little experience and certainly not in colder water or entering from the shore. But the information and guidance in and out of the water was very good. As most others have noted the team at Davy Jones are very safety conscious, gently guiding and reminding as necessary. And enthusiastic and knowledgeable about the marine reserve. Thanks Eduardo and the rest of the friendly team. Definitely recommend. At age can you start to scuba dive? What PADI courses can juniors take? What are the depth recommendations for junior divers? What dives can my junior qualified diver do in Gran Canaria? Do you offer snorkelling for juniors? At what age can you start to scuba dive? The decision on when to let your child try scuba diving for the first time is a very individual one. The law in the Canaries was relaxed in 2006 and now any child (ie under 16) may undertake scuba diving 'with the written approval of the parent'. For the parents and dive centres there are four factors to take into account: size, physical preparedness, mental preparedness and commitment. Size is a major factor, as equipment needs to fit properly when you scuba dive, and if it is too big it is uncomfortable and dangerous. We only have certain small items (Junior BCD, wetsuit and boots) but for example the smallest boots we have are size 3; so if a child is much smaller, then it is better to wait for them to grow. We try to keep equipment small enough to cover an average 10 year old and above. Physical preparedness no longer requires that every diver take a weight lifting course; however any child taking a scuba diving course will be expected to carry their own equipment for short distances, and they should be capable of swimming continuously for forty minutes, and taking part in normal field or track sports. Mental preparedness requires a certain level of personal confidence, personal problem solving skills and for those taking the junior PADI courses, a reasonable understanding of basic physics. Finally, the child themselves must be committed to diving. They must want to do it, and not be pushed into it by peer or parent pressure. European Water Safety Guidelines issued by Child Safety Europe for children who intend to go Scuba Diving say "The most important factor in youth SCUBA diving is whether a child is truly emotionally and analytically ready to handle the risks of an underwater environment. Even experienced adult divers are prone to panic or behave irrationally in an emergency." They also recommend that Children should be a minimum weight of 45 kilograms and a minimum height of 150 centimetres before beginning training.In general, we have found that some children are big enough and ready by the age of ten, but a better age is around twelve, as mental preparedness, personal confidence and ability to understand the physics are all more developed by this stage. We will always discuss openly the appropriate age at which to start diving with a parent or recommend what route to take. The first step for anyone who has never dived before is to take a Discover Scuba Excursion to see if they like it. We always provide additional instructor support for very young or small divers. This can be counted as the first dive on a qualification course. For younger children (10 to 12) who want a diving qualification, we recommend that they take the PADI Junior Scuba Diver Course, rather than the full Junior Open Water Course, for a number of reasons. Firstly it is less intense, and does not require the same depth and commitment to study; Secondly the physics and concepts are easier, as Decompression tables are only included in the second part of the Open Water Course, and finally, Junior Open Water and Junior Scuba Divers can only dive to the same depth .. ie 12m, so the advantages of taking the full course are minimal. At any time a Junior Scuba Diver can take the conversion course with us to upgrade to an Open Water Qualification, and when a Junior Diver becomes 16 their qualification automatically converts to an adult status. For those who really enjoy their diving it is possible, once they have completed the Junior Open Water Course and are over 12, to take the PADI Junior Advanced Open Water Course with us in the El Cabrón Marine Reserve in Gran Canaria. This course has five dives which help to build confidence and extend skills to take on more challenging dives. For junior divers who wish to further broaden their skills and range of experiences, there are several PADI Speciality courses which can be taken (eg Underwater Digital Photography, PADI Fish Aware, Peak Performance Buoyancy) which can lead to the PADI Junior Master Scuba Diver certificate. What are the recommendations for Junior Divers? For the safety of all divers, PADI has a series of recommendations covering the safety and supervision of Junior divers. We support and follow these recommendations completely and always recommend that both junior and senior divers always dive with a partner or 'buddy'. Junior Scuba Diver Following qualification, the student must always dive with an Instructor or Divemaster, with a maximum depth of 12m. This depth restriction does NOT change with age, but they can take the upgrade course to Open Water with us at any time. Junior Open Water Diver Following qualification, the student must dive with a more experienced adult diver. After certification, a 10 or 11-year-old Junior Open Water Diver must dive with a parent, guardian or PADI Professional and not as part of a large group. Dives must not exceed 12 metres. A 12 to 14-year-old Junior Open Water Diver is qualified to dive only when accompanied by another certified diver who is over 18. Dives must not exceed the maximum depth achieved with an instructor, and this instructor led depth progresion from 12 to 18m should be progressive. When they become 15, They may dive to 18m with other adult Open Water divers. Junior Advanced Open Water Diver Following qualification, it is recommended that a 12 to 14-year-old Junior Advanced Open Water Diver is qualified to dive only when accompanied by another certified diver who is over 18. Dives must not exceed 21 metres. When they become 15, they automatically are recognised as Advanced Open Water Divers and may dive to 30m with other divers with similar qualifications. In addition we follow the European Union "Water Safety Guidelines for Service Operators". We offer several different types of diving, from dives in the marine reserve, to boat dives and night dives, and have at times included Junior divers (usually with a parent) on all of these types of dive. However in terms of depth we stick closely to the recommendations of the training agencies, so Junior Open Water and Junior Scuba Divers can dive to around 12m deep. This gives us large areas which we can explore within the Marine Reserve, including the top of the 'Table Top', the first part of Punta de la Sal, the whole of the Playa del Cabrón down to the second cave as well as Risco Verde, Cal Steps and several other dives. If after an initial dive we are comfortable with the Junior's diving skills, then following discussion and agreement with the parent we may undertake some instructor supervised depth progression (usually as part of their Junior Advanced Open Water qualification) so that when they turn 15 and automatically become full Open Water Divers, they have had some instructor led training to these depths. Do you offer snorkelling for children? We offer instructor guided snorkelling excursions for small groups, in the Marine Reserve at Arinaga in Gran Canaria. We can take children down to about eight years of age, using extra small fins and masks and shortie wetsuits. In all cases with young children a parent or responsible adult must be present (spectating if not taking part). This can sometimes be run alongside a diving excursion so that some of the family can dive and some can snorkel. This does however require a dedicated instructor for snorkelling trips so please check on which dates are available in advance. Yes, the safety and protection of all of our clients is paramount, both in and out of the water. It is a condition of employment that all staff accept and abide by our policies for the protection of all/any vulnerable divers, including children. It is important that all parents are actively involved when their children are diving (either on the shore or in the water), and report any concerns immediately to either one of the instructors or the management team.